Ever thought how else you could wear a skirt if not as a skirt? How you could have a colourful belt for your attire by using your stole? 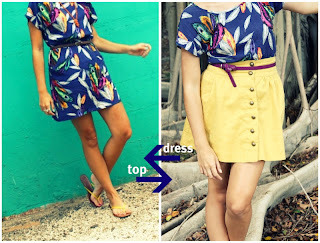 Wear your short floral skirts as a top and the longer ones as a dress; use a thin belt to hold it at the waist. 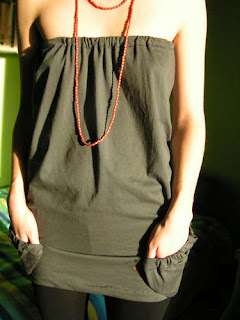 Alternatively, wear a blouse over a short dress to have a never-before skirt-top combo. Pin a flower to your hair, and you look like summer’s favorite child! For the bohemian look, fold your colourful scarves and stoles and use it as a hairband. Let the end fall over your shoulder. Wear a long tunic that falls below your knee. Wear a well-fitted skirt over it – the tunic serves as the border for your skirt. Spice up your old t-shirts by attaching ruffles or lace at their hem and adding elastic to their sleeve ends to give it a more feminine look. If everything fails, just wear a lot of colour with oodles of confidence and you’re great to go! very good collection of items from books, music, movies, electronics, cameras, mobile phones, jewellery, apparel, CD-ROMs, customized gifts, pens, flowers, chocolates, cakes, sweets, toys, watches, handicrafts, art prints, perfumes, cosmetics, home furnishings, food items, to health products.